October is National Dental Hygiene Month. It’s a great time to talk about your first line of dental defense: your toothbrush. Brush gently twice a day, every day, for two minutes each time using a soft toothbrush. Scrubbing with too much force or with hard bristles can damage gums and tooth enamel. 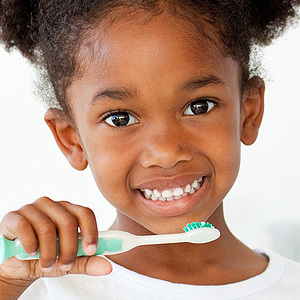 Use fluoride toothpaste to prevent tooth decay. Fluoride is a mineral that builds tooth enamel to prevent tooth decay. Replace your toothbrush every 3 to 4 months or when the bristles start to look frayed, curled, or worn. Rinse out your mouth thoroughly after brushing to get rid of bacteria and food debris that you worked loose from your teeth. Also rinse your toothbrush well after each use to wash away the debris and bacteria you just brushed from your teeth. Let your toothbrush dry out between uses. A toothbrush that is stored in a closed container can become a breeding ground for bacteria. Keep your toothbrush to yourself. Sharing toothbrushes is a way to share disease-causing germs as well. Follow these pointers and come in for regular dental visits to help ensure healthy teeth and a bright smile. If you have any questions about your dental hygiene routine, be sure to ask us.